The original key had been placed on loan to the Smthsonian, and this replica was produced by the Smithsonian. 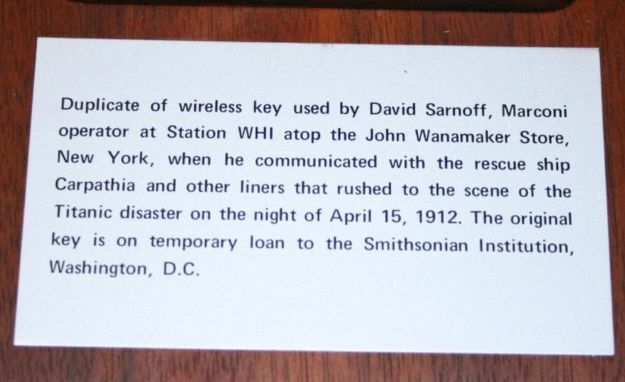 Later, the original key was returned to The David Sarnoff library in Princeton, NJ. The library was closed last year, and the original key, along with other artifacts went to the College of New Jersey. This replica is now the property of InfoAge. We are seeking information. Who made the original Ket? Are there others in exixtence? Why does the mechanism rotate? What is the "pencil holder" on the side? (It's threaded on the inside.) Etc.